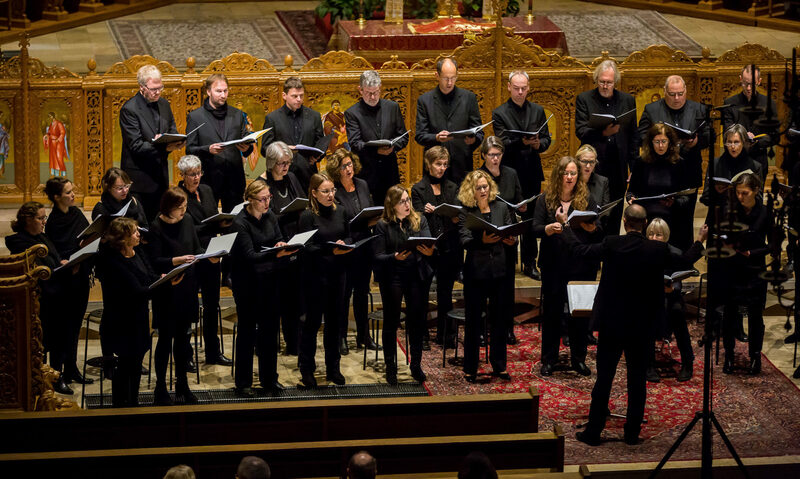 Cappella Aquensis was formed in 1963 by a splitting of the Aachen Cathedral Choir. It was first directed by André Rieu, who was at the time musical director of the Symphonic Orchestra of Limburg. He was succeeded by a number or conductors until, in 1977, Thomas Beaujean took over and directed the choir until 2017. Thomas Beaujean has been and still is an important and defining influence in Aachen’s musical landscape and he decisively shaped and defined our choir. We have enjoyed a multitude of successful concerts and concert tours with him. Especially the annual Christmas Concert in Aachen’s historical City Hall is one of his many creations. In 2013, we celebrated our 50thanniversary with a concert in St. Michael and a Jubilee High Mass in Aachen Cathedral. Since January 2018, Ulrich Brassel is our new choral director. We look forward to the coming years with him and to many successful and joyful concerts under his direction. If you want to find out more about our past, you can obtain our Anniversary Festschrift – just contact us if you’re interested.